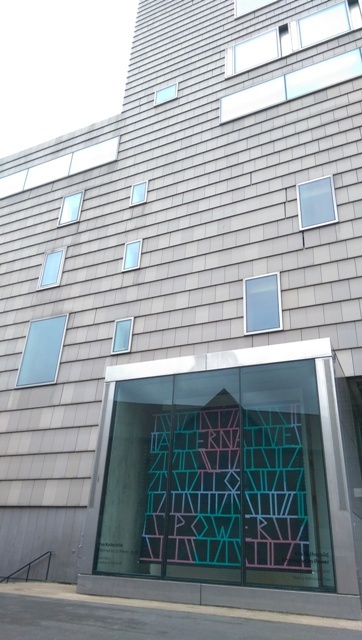 The new banner artwork has been specifically made for the Gallery’s Window Box as part of Eva Rothschild’s Alternative to Power exhibition which opens to the public from Saturday 24 September 2016 – 15 January 2017. Eva Rothschild is one of the leading sculptors of her generation and has gained extensive international recognition for her work. She works across a range of media including steel, leather, resin, plastic and fabric and her work is often characterised by the use of unstable geometric forms. This will be Rothschild’s first solo exhibition in the Midlands and the new body of work will include a specially commissioned piece using leather, a material at the centre of Walsall’s manufacturing industry.